Dogs love to run! Running or jogging with your dog is a good way to help your pet maintain a healthy weight, improve muscle tone, maintain a strong cardiovascular system, and build fitness. Running with your dog requires some training to ensure it is an enjoyable experience for you both. It is important to train them to run nicely by your side so they don't pull you around! It is useful to teach your dog commands like ‘we're running’ and ‘let's walk’ so they understand the transition between walking and running. If your dog already knows how to heal or walk on a loose leash it should be easy to teach them to run by your side. You can do this by gradually increasing the speed that you run at and using your existing commands for loose leash walking. 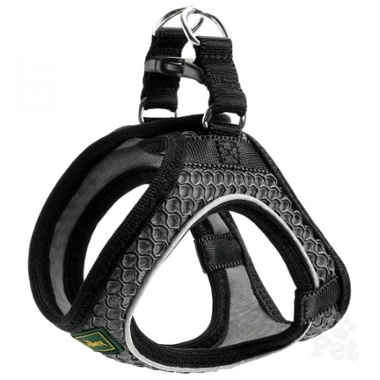 It is best to run your dog on a harness like the Hunter Hilo Harness to take away the pressure on their necks. With a harness, your dog is able to run without obstruction as well as giving you better control over your dog. But running is not only beneficial to their physical health and fitness, but it also has benefits for their mental health! Running makes dogs happy and allows them to explore more of the sights, sounds and smells of the world. It helps to release pent up energy and makes them better behaved and less destructive. But most of all, it is an enjoyable way to spend quality time with your pet. But not every dog is built for running, so it is important to know your dog and take it slow especially when first starting to run with your dog. Another way to keep your dog active and entertained is to get them to use their nose by playing on their naturally strong sense of smell. There is a couple of ways you can do this, such as playing hide and seek with your family members and getting your dog to sniff out their hiding spots. Or hiding their toys throughout the house and getting them to find them. Nose work games are one way to encourage exercise even for dogs that are more lazy, as they use behaviours that are instinctual to them. In order to keep your dog fit and in good health it is very important that you understand how to provide a healthy, balanced diet appropriate to your dog’s individual needs. Whether you buy your dog food or make it yourself, your dog needs a balanced diet to stay healthy. That includes a mix of proteins, carbs, fats, vitamins, minerals and water to ensure your beloved pet is getting all that they need. This can be in the form of dry dog biscuits, wet dog food, homemade dog food or raw food or a mixture of the above. Dogs don’t just need exercise, they thrive on it!. As a guide, most dogs need between 30 minutes and 2 hours of vigorous exercise a day. Although this greatly depends on age, breed and medical history. For example, working or herding dog breeds such as Border Collies,Terriers, Huskies and German Shepherds require the most exercise. Daily exercise can come in many forms, not just the common walk around the block that many people think of. An easy way to exercise your dog if you are low on time or the weather is bad, is to play a simple game of tug. Minute for minute playing tug with your dog is one of the most intense forms of exercise out there. Not only is tug a fun way to get your dog a physical workout but it also provides an opportunity to strengthen your bond between you and your pet. It also is a good way to train the ‘drop’ or ‘leave it’ command for your dog. Swimming is a great all-around activity to keep your dog fit and healthy. It is a low impact form of exercise that strengthens muscles while providing a cardiovascular workout so it is great for both overweight and elderly dogs. It is also lots of fun! Whether it's at a local river, lake or beach swimming is a great way to help your dog get active especially in the summer season when your dog may overheat when doing other forms of exercise. When trying to help your pet reach a healthy weight it is important to consider not only the food that they are receiving but any extras or treats. We are not saying you should not be giving your dog treats at all, but if you are going to think carefully about what sort of treats you provide. As this needs to be taken into account when calculating how much they should be getting for dinner. Many treats on the market are high calorie, but there are also healthy natural treat options out there. Did you know? That dogs care more about the number of treats they receive than the size of each treat, so it’s more rewarding for a dog to receive several small treats than one big one. Another idea if you feed dry food is when you weigh out your dog's daily meal, set aside a few biscuits from this to use as treats throughout the day. Fetching a ball or favourite toy over and over provides a lot of exercise for your dog, as well as helping to maintain a healthy heart and strong lungs. Fetch comes naturally to most dogs. But for some you will spend time training a few commands - the hardest being the drop command! The good thing about fetch is that you can play it indoors and outdoors no matter the weather. So it is a great all year round game to play to keep your dog happy, fit and healthy. Instead of using a ball it is also fun to fetch your dog to fetch a frisbee, this involves a bit more skill and agility than catching a ball! 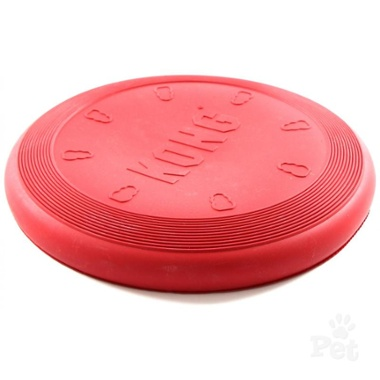 When selecting a frisbee for your dog it is important to make sure it is rubber and soft like the Kong Flyer Frisbee, so as to not damage your dogs teeth when playing fetch. Keeping your dog fit and active does not have to be boring. A fun way for the whole family to get involved is to do trick training with your dog. Whether it is basic commands like sit and stay, or more fun party tricks like play dead or roll over. Trick training sessions are an exciting way to physically and mentally exercise your dog. Mental stimulation is extremely important for dogs and is often more tiring than physical exercise. So keep your training sessions short and fun. Avoid being too repetitive by changing the exercises regularly and keep it positive by throwing in some tricks your dog already knows. It’s critical to actually measure out your dog's food, never just guess. Most dry dog food comes with a cup measurement and feeding instructions on the back of the pack. It is important to follow these instructions, but if your pet is overweight do not feed for their current weight, feed according to their ideal or target weight. Let’s face it. Dogs eating their dinner sometimes looks more like a race than a casual meal. 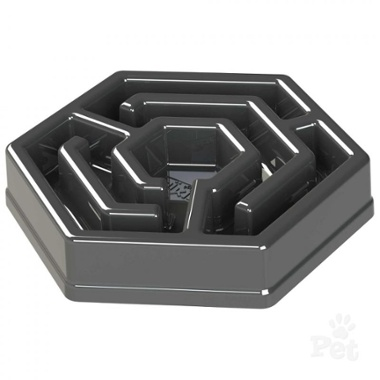 If your dog finishes her dinner in a few hasty mouthfuls, it might be worth considering using a slow feeder like the Aikiou Hexa Slow feeder, this is a dog bowl with built-in obstacles, mazes or grids that help spread the food out and make eating more of a challenge. Using a slow feeder makes your dog work harder for their food, which helps to reduce the pace that they eat at. For many dogs, a brisk walk around the block is not enough to keep them stimulated, fit and healthy. But the good news is that is are many other ways to get fit with your dog. Dog sports are a fun and varied way to exercise your dog, whether it is agility or flygility these sports offer countless ways to maintain or improve your dog’s physical fitness and condition. In agility, owners train their dog to correctly negotiate a variety of different pieces of equipment from jumps and tunnels and weaves. Meanwhile, in flygility your dog does a series of obstacles then hits a box which releases a tennis ball. They grab the ball and run back over the obstacles and come back to you! Dog sports not only exercise the body, but they also offer mental stimulation and an opportunity to bond with your dog and have a whole lot of fun!! Not only do dogs need physical exercise, but mental exercise is also just as important. Pick up some boredom busting toys like a filled Kong to keep your pet mentally stimulated and entertained. Even if you are trying to help your dog lose weight, a food toy can be a good idea to ditch the bowl all together. And feed food in smaller portions throughout the day through treat toys and as rewards for good behaviour. This means that the dog will have to work for the food, it will not just be given to them, this is helpful as it gives them a motivation to keeping active and makes it a lot easier for you to slow down their eating. Keeping your dog healthy and in good shape does not need to be boring. The key is to increase their activity levels and keep a close eye on what kind of food and the amount that they are consuming. To help your dog get fit and active, get the whole family involved and think beyond the traditional walk around the block. Mix up your routine by playing fetch, taking your dog for a swim, joining a local agility club or playing a game of tug. The benefits of keeping your dog fit and healthy are far-reaching, helping to improve your dog's behaviour, mental health, physical health as well as helping them to live a happier and longer life.